It’s becoming light & the birds are chirping, I awake before the alarm clock. In the twilight, I’m scanning the time lapse rain cloud data from the weather App on my phone to check the possibility of rain. With a following wind, & a bit of good fortune from the weather Gods, we should all be OK. After all, we live in the UK so are very familiar with rain anyway. Some say the Eskimos have over 100 words for snow. Perhaps we should have the same number of words to describe rain? With a full tank of fuel, packed waterproofs, I rock up to 611 KR (super early) expecting to be first there. I’m greeted by Graham Tame smiling expectantly, waiting on his very shiny & capable Tri-Glide, explaining that it’s his first C&F ride. Rob Warr fires up the “swipe in” computer & we are good to go. The potato, potato rumble increases as C&F and Meridian HOG riders start to arrive at 611 KR. The computer said “yes” to all attendees. Appropriately Chocolate coloured, The Chocolate Box ride stickers were duly attached to headlamps. As customary, the gate closed promptly at 09:30. Morning prayers are accomplished, then we all set off. 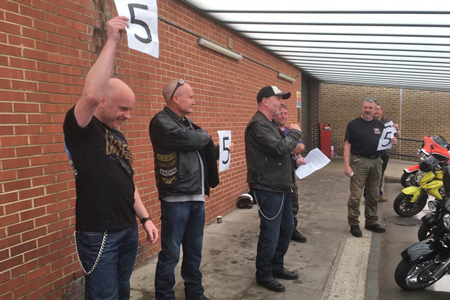 With the help of the virtual Jackson 5, on motorcycles, performing high fives we all successfully exited M4 Junction 5. We reconvened briefly, before setting off again into the country towards Windsor. Taking in the sights of Datchet, Windsor, Bray & Henley-Upon-Thames, we snake our way alongside the River Thames towards Crazy Bear, Stadhampton. The minor hiccup of a closed road tested our patience but strengthened our resolve as we re-calculated & punched our way through to our coffee stop at the Crazy Bear. It certainly served to emphasise that as a Group, C&F and Meridian H.O.G., are “not too shabby” executing the drop off system & certainly demonstrate the steely resolve of steadfastly marking junctions. Onwards, Burford majestically unfolds in front of us as we slowly descended down the hill through the town, signalling the gateway to the Cotswolds. The rolling countryside (the Wolds) opens up & the honey coloured stone of the Chocolate Box cottages started to shimmer as the sun provides us with a welcome break in the clouds. Heading into Stow-on-the-Wold we encountered 2 horses & their riders. The front horse looked a little nervous so we elected to pull over stop our engines. Upon reflection, I think that was absolutely the right call & this was gratefully received. Lisa Gunther recalling happy times working in the Music Industry (recording studio) in the Cotswolds. Cathy Robert’s infectious enthusiasm & for falling instantly in love with Burford (I think that she is already making plans for a return visit). For Dan Riman, Chipping-Norton prompting fond memories of a long weekend enjoyed years gone by. 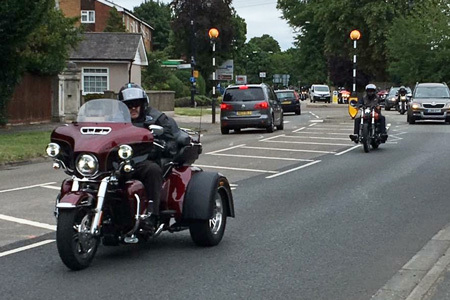 And Graham Tame, his first ride with C&F and Meridian HOG, on his trusty Tri-Glide. Later that day, John Warr received a complimentary email from a local Henley resident congratulating him on “how resplendent we all looked & how well behaved we were riding, thanking & showing courtesy to other road users”. What a very nice man. The Slaughters Country Inn recently featured in the Telegraph Top 10 best hotels in the Cotswolds. Not by design, but nice to see C&F and Meridian HOG being ahead of the curve when choosing our lunch venue. Dicky (Richard Biddle) stayed behind & had arranged a high level (National) Backgammon match (2017 UK Backgammon champions league) which I’m glad to say, (after 5 intense hours) he deservedly won. From 40 league players Nationwide Dicky is now through to the final 8. Congratulations & good luck. Many thanks to John Warr, and all C&F H.O.G. Road Captains for your insights on the previous week’s Recce (Colin Houliston, Paul Wiggins, & Steve Graham) & for those expert RCs on the day (Colin Houliston, Rob Warr, Andrew Papas, Fred Woolcott, Mick Newstead & Nick Deal). Literally last (but not least) many thanks to Colin Houliston for executing the universal signal to move on so well (& for being last man). 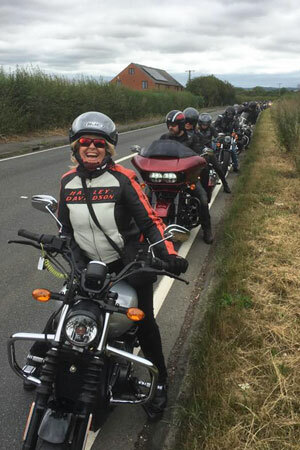 I have an enduring image of Graham Tame smiling on his Tri-Glide courteously filtering (yes filtering) on the gridlocked M40 on the way back home after the ride - (slowly & safely I add) as the cars parted like the red sea before Moses, with the Israelites following behind - absolutely priceless, you can’t make this stuff up. I don’t think I’ve thanked so many stranded motorists in such a small space of time. The Chocolate Box ride served to emphasise, what we all already know, that it’s all about the people that make it such a memorable day. Thank you C&F and Meridian H.O.G. for making The Chocolate Box ride such a memorable day for all, I am proud to call myself a C&F and Meridian H.O.G. member. The weather Gods smiled down on us & the rain abated. Second thoughts, we don’t need over 100 words for rain. 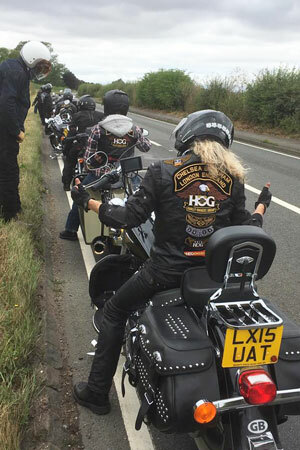 Don’t forget, the next C&F HOG ride is The Super Sausage Racing Saturday (Saturday 05 Aug 2017) Ride Leader: Steve Graham.